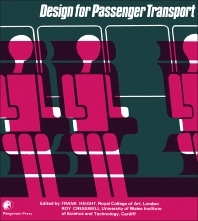 Design for Passenger Transport focuses on the ways by which standards of design could be improved to enhance the psychological and physical well-being of both passengers and staff. Various aspects of design in the fields of air, rail, road, and water passenger transport are discussed. The selection first tackles passenger handling design in airports, railway stations, and transport interchanges, including care and comfort of passenger movements and exploitation of commercial potential arising from the concentration of passengers. The book also elaborates on airline and travel industry requirements, terminal concept and parking, terminal buildings, and rail/ terminal link. The text takes a look at the design policy for greater Manchester transport, including principles and objectives, informational publicity, and point of sale. The publication also focuses on passenger behavior and expectations at airports, as well as survey of passenger behavior and expectation and implications for airport planning and management. Vehicle suspension systems and design, track irregularities, and minimum standards for passengers are also discussed. The selection is a dependable source of data for readers interested in the design of passenger transport systems.